Belnacasan (VX-765) is a potent and selective inhibitor of caspase-1 with Ki of 0.8 nM in a cell-free assay. Phase 2. (D and E) Caspase-1 inhibitors (Ac-YVAD-CMK and VX765) were added during the induction of trastuzumab-dependent BT-474 (red) or rituximab-dependent Raji cell phagocytosis (green). MFI of PD-L1 (D) and IDO (E) in macrophages are as indicated. Z-VAD-FMK is a cell-permeable, irreversible pan-caspase inhibitor, blocks all features of apoptosis in THP.1 and Jurkat T-cells. (A) LAN5 cells were untreated (top panels) or treated with 50 µM of the caspase inhibitor Z-VAD-FMK (bottom panels). Cells were co-treated with nothing (No Rx), 1 µM GSK-J4, or 1 µM venetoclax for 48 hours and assayed for apoptosis by flow cytometry. Z-LEHD-FMK is a cell-permeable, competitive and irreversible inhibitor of enzyme caspase-9, which helps in cell survival. Z-IETD-FMK is a specific Caspase-8 inhibitor. The caspase-8 inhibitors do not rescue NB4 cells from TPEN-triggered apoptosis. NB4 cells were pre-treated with 50 μM Z-ITED-FMK or 100 μM Ac-IETD-CHO for 1 h, and then treated with 5 μM TPEN for 24 h. (A) Cell morphology was observed and recorded using an optical microscope. The scale bar represents 20 μm. A partiallty enlarged view was shown in the lower left corner of every picture. (B) Apoptosis rate was measured with Annexin V/PI dual staining by flow cytometry. Immunoblotting analysis was performed for the active-caspase-3 and cleavage of MCL-1 in MM.1S cells treated with z-DEVD-fmk (20 μM, 1 h) and following GSK126 (25 μM, 24 h). Q-VD-Oph is a potent pan-caspase inhibitor with IC50 ranged from 25 to 400 nM for caspases 1,3,8, and 9. UA and Q-VD-Oph attenuated TNF-α-induced unclear translocation of NF-κB (C) and P-STAT3(S727) (D) in BEAS-2B cells. Effect on the RAS of CFZ, z-VAD-fmk, or CFZ+z-VAD-fmk treatments administered 5 or 12 days after C26 inoculation and control groups. Serum levels of a renin and b ANGII. c The mRNA expression of ATF2. d Western blot analysis of ATF2 and pATF2. e pATF2-to-ATF2 ratio. Significant differences were detected between most of the groups, with the exceptionsof (A and B) CP and UT (D) and ZP and ZT (#); and (C and E) CP and UP (*), CT and UT (#), and HC, ZP, ZT and CC (&). ZP:z-VAD-fmk. Ac-DEVD-CHO is a potent aldehyde inhibitor of Group II caspases with Ki values of 0.2 nM and 0.3 nM for for caspase-3 and caspase-7, respectively. Weak inhibition for caspase-2. Microwave (MW) hyperthermia triggers cell death through caspase-3-mediated apoptosis. H460, PC-9 and H1975 cells were treated with or without Ac-DEVD-CHO for 3 h prior to MW hyperthermia (43°C for 90 min), then allowed to recover at 37°C until 24 h. (A) Cell viability was determined by CCK-8 assay. Data are expressed as the means ± SEM of 3 independent experiments. *P<0.05 vs. the control group, **P<0.01 vs. the control group. PAC-1 is a potent procaspase-3 activator with EC50 of 0.22 μM and the first small molecule known to directly activate procaspase-3 to caspase-3. The effects of PAC-1 (activator of ROS) administration on the newborn pups' weight and the plasma IGF-1 and ROS levels in graviditas gp91phox-/- mice. The values are presented as the means ± SD derived from six animals. *P<0.05 in comparison to the non-treatment mice. Apoptosis Activator 2 strongly induces caspase-3 activation, PARP cleavage, and DNA fragmentation which leads to the destruction of cells (Apaf-1 dependent) with IC50 of ~4 μM, inactive to HMEC, PREC, or MCF-10A cells. 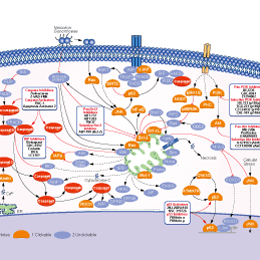 Tasisulam is an antitumor agent and an apoptosis inducer via the intrinsic pathway. Phase 3. Alisol B acetate, a triterpene from Alismatis rhizoma, induces Bax up-regulation and nuclear translocation, the activation of initiator caspase-8 and caspase-9, and executor caspase-3, suggesting the involvement of both extrinsic and intrinsic apoptosis pathways. Gambogic Acid activates caspases with EC50 of 0.78-1.64 μM and competitively inhibits Bcl-XL, Bcl-2, Bcl-W, Bcl-B, Bfl-1 and Mcl-1 with IC50 of 1.47, 1.21, 2.02, 0.66, 1.06 and 0.79 μM, respectively.